How to draft a Sample Montessori Preschool Teacher Resume that will impress? How to grab your futures employers’ attention when you are applying for a new job? 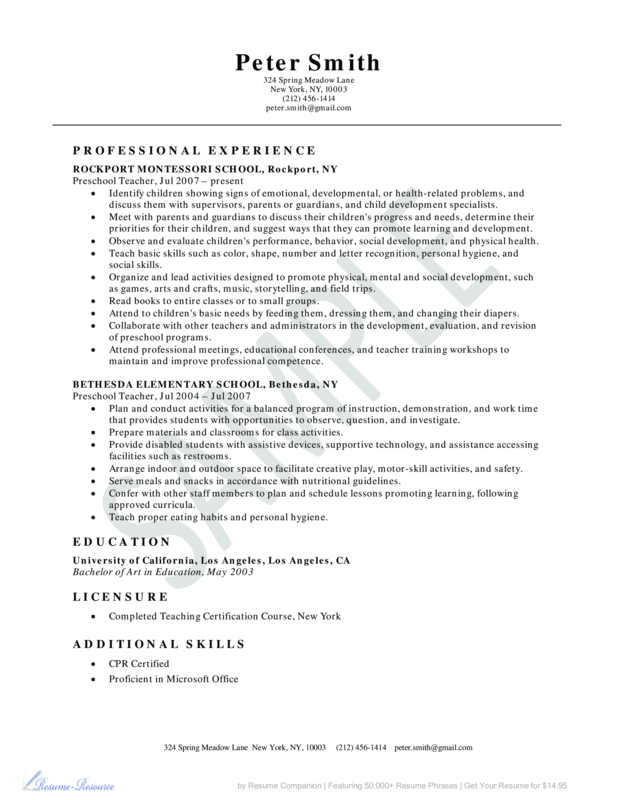 Download this Sample Montessori Preschool Teacher Resume template now! This Sample Montessori Preschool Teacher Resume template will grab your future employer its attention. After downloading and filling in the blanks, you can customize every detail and appearance of your resume and finish. Completing your Sample Montessori Preschool Teacher Resume has never been easier, and will be finished within in minutes... Download it now! Peter Smith 324 Spring Meadow Lane New York, NY, 10003 (212) 456-1414 peter.smith gmail.com PROFESSIONAL EXPERIENCE ROCKPORT MONTESSORI SCHOOL, Rockport, NY Preschool Teacher, Jul 2007 – present • Identify children showing signs of emotional, developmental, or health-related problems, and discuss them with supervisors, parents or guardians, and child development specialists..